Growing up, this thoughtful but sassy artist always painted just for fun in messy abstracts. She remembers that her art teacher was extremely strict and passionate, and at the time she thought it was a bit weird how intense she was. However, she has come to appreciate it now in her own art. Always an “informal artist,” her husband was the one who first took her art to a gallery. When they asked for a body of work, Kaitlyn realized she didn’t have one and spent a year remembering experiences and painting. Living in Florida and vacationing in St. Augustine, Kaitlyn was influenced by her time spent on the beach. However, she often visited North Carolina, which has led to her split spirit between the mountains and the ocean. She also took inspiration from her marriage. 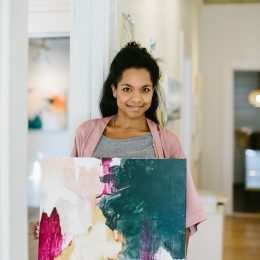 She and her husband have been together since she was fifteen, and he has been a big influence on her painting, unlocking within her the freedom to create. Her family has also been an important aspect in her work, as they all are artistically inclined in one way or another. Still learning her style, she is still finding out what colors express how she feels. Neutrals were always her go-to until she took a trip to Europe and discovered that pinks and dark blues spoke to her. She begins her works by picking a few colors and testing out which ones she wants to use. She then moves to the canvas, adds and takes away, blurs and rubs until she has a fuzzy first layer and then adds texture. She has recently started using pastels to add imperfect lines that look like they shouldn’t be there, but in fact they make all the difference. She continues to edit until she does not want to add anymore. Get to know Kaitlyn, a free-spirit with a talent for abstract expression in her work. Join her on her journey of artistic self-discovery.